Product #60791 | SKU 996551011 | 0.0 (no ratings yet) Thanks for your rating! The Voicesolo FX150 from TC-Helicon is a compact personal PA and vocal processor that offers personal monitoring and built-in effects including AEQ, compression, doubling, harmony, echo, vocal tuning, flanger, choir, and more. 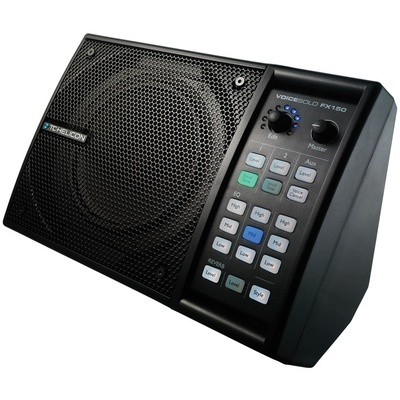 It can be used for a variety of applications such as vocal FX, stage monitoring for vocals, instrument amplification, or it can be used as a small PA speaker. The unit also features dual XLR/TRS combo inputs with switchable 48V phantom power, and 1/8" aux input and a 3-channel digital mixer. The FX150 can also be mounted to a mic stand using its "one-click" mounting system, which allows you to secure it to a stand without any additional hardware pieces.